As some of you may know, I've been taking an online knitting class. I really like it and I've thoroughly enjoyed learning something new. I've been taking things a little slow because I only practice it here and there in between projects. 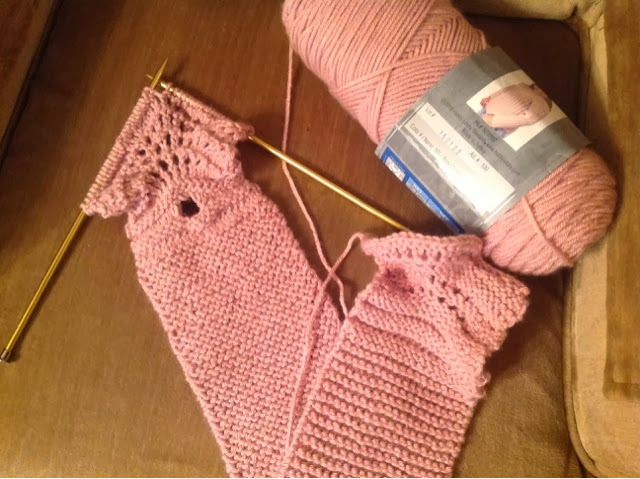 Well a few days ago I decided I was done practicing and went ahead and started my scarf. I might as we'll create something while I'm practicing, right? It's coming along slowly but here it is almost finished. The scarf is knit in two pieces so I still have to sew it together, weave in the ends, and block it. Winter weather arrived this weekend and brought with it some snow. Not much, just two or three inches but it was blustery and the temperatures stayed below thirty degrees all weekend. Since we weren't about to go anywhere I thought it would be a good time to put up the Christmas tree. The kids and I turned on some Christmas music and got busy. We had a little help from hubby too. 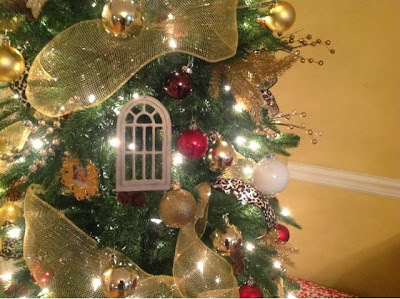 I don't want to post pics of my tree yet since it isn't officially Christmas time. I'll save them for a later post. I'll just share this little peak at it. This is my next project. It's a little crochet capelet. A lady in town asked me to make this for her daughter. She wants a matching headband and a matching capelet and headband for the little girls doll. How cute is that? It will be a Christmas present so I'll be starting on it tomorrow. And to tell you the truth I am really looking forward to going back to crochet. At least for a little while. 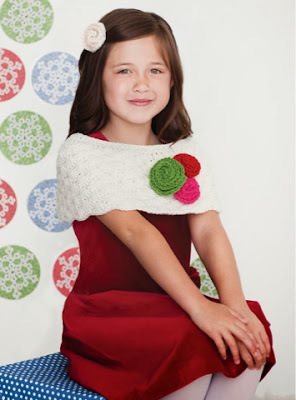 Wow, your knitted scarf looks beautiful - well done :-) And I love the look of that little crocheted capelet too - could you point me in the direction of the pattern for it please? Your scarf is going to be beautiful ! Lovely trre you have ! I'm waiting to see your next project ! Have a nice and cozy day ! the scarf is pretty I love the color and the pattern at the end! the capelet will look beautiful as well. The Christmas tree is gorgeous and it makes me excited to put mine up soon too! I absolutely LOVE that scarf! Did you get the pattern from your online class? Can't wait to see it finished ~ and to see the rest of your beautiful Christmas tree. The little capelet will be a fun project. So very pretty. Happy December.....wow that is gorgeous ...it will be a great gift and handmade...nothing better than something handmade. Love it !